Beauty Pilot is a photo retouching tool to correct and makeup photos. It could easily remove small defects and sopts on the photo skin. It makes make the picture look better and bring out the beauty in women's portraits by erasing a skin imperfection on an image (moles, warts, pimples, heat-spots). Note: Run BeautyPilotPortable.exe to launch Beauty Pilot Portable. 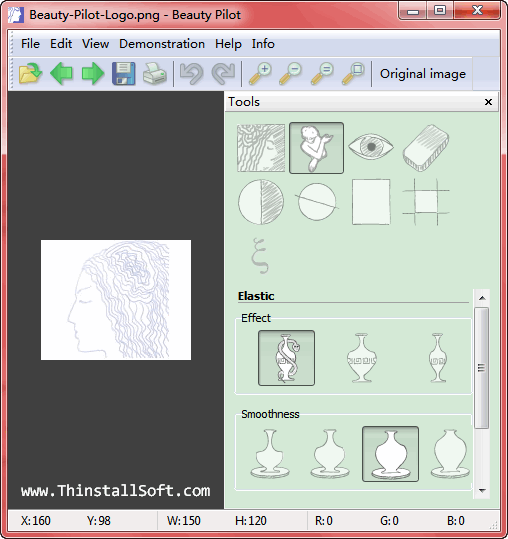 The current version is Beauty Pilot 2.5.2 Free Giveaway Edition. Soft-focus Lens: Remove small imperfections (spots, birthmarks) from the picture and smoothen the skin. Eye Color: For eye color changes. Undo Brush: Reverts to original image in the area the tools were previously applied. Brightness and Contrast: Change the brightness and contrast of an image. Rotate and Flip: Rotate and flip an image. Crop: Crop a photo using Manual, Printing formats or Display formats Modes. Text: Inscribe images using texts. What's new in Beauty Pilot 2.5.2? You could also try some other digital image correction software to makeup photos such as Retouch Pilot, Inpaint, PhotoWipe or Photo Stamp Remover. This entry was posted in Photo & Graphic and tagged beauty pilot, beauty pilot portable, eye color change, image correction, image logo remover, lens correction, logo remover, photo logo remover, photo makeup, photo tool, picture logo remover. Bookmark the permalink.